I did some profiling with Xdebug on my Phalcon micro application and found some major issues. Do you guys have any suggestions how i can improve performance... ? Most of the time on production result of all mounts could be just cached, and instead of mounting them you could just set handlers. 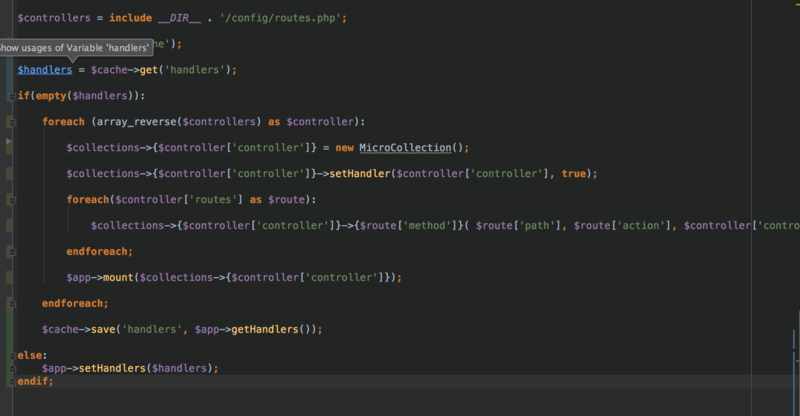 Extend phalcon micro and add such functionallity yourself, simple as that. Not sure why phalcon doesn't provide setter. Though this is exactly why i wrote there it might be actually a slow, well i forgot to mention there that i mean caching routers with closuers, that you need to use 3rd party. Atually if you have router without closuers it might be faster. You could eventually try not use lazy and then caching if you don't care about memory. You sure that those controllers doesn't have any closuers somewhere? You need to just find where you have closure in this code and try to refactor it somehow. Also don't use persistent for this, use cache. Also i forgot to mention but you also need to use $this->router->getRoutes() and cache them as well since mount is also adding route objects. Yea i wrote you above also that you need to cache routes. Handlers are just handlers, routes are routes.